The very early history of Buckland Mill is rather obscure, however it is known that Buckland Mill was one of a number of mills operating in the Dover district during the 18th and 19th centuries. Papermaking was a flourishing industry around this period, with at least six mills situated on the stream running through the Dour Valley at Bushy Ruff, River, Crabble, Lower Buckland and Charlton Green. With the passing of time, only Buckland Mill now survives as a paper mill, the other mills have disappeared. The mill fall at Bushy Ruff can still be seen to this day, as can the ruins of the mill at River and the old loft dryer building at Lower Buckland. 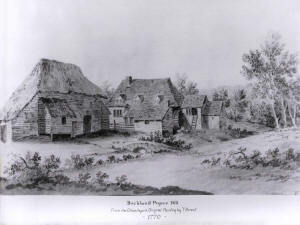 The earliest proof of the existence of Buckland Mill is contained in a picture entitled ‘The Paper Mill at Buckland, Dover’ and dated 1770. At that time, paper was made by hand and Buckland Mill would have been a very small place, producing only a few hundredweights of paper in a week. Ingram Horne, a land owner in the parish, was the owner of Buckland Mill and in 1777 was making paper there. In his book on Kent 13 years later, Hasted stated that the mill had recently been very much enlarged. Thomas Horne, possibly a son of Ingram Horne, is mentioned as the owner of Buckland Mill in 1799. Fifteen Years later, the mill burnt down and was rebuilt in the same year by Thomas. His initials and the date 1814 were put on the keystone that was over the water wheel, this stone is still on site. Around this time significant new advances were being made in the papermaking process. Across the English Channel, in 1799, a Frenchman by the name of Louis Robert had invented a machine with which it was proposed to produce a sheet of paper 12 feet long. An English engineer named Donkin made improvements to it and finally two stationers, named Fourdrinier, took over all interests in the machine and, as a result, one of them took out a patent in 1806 for a machine to produce a continuous sheet of paper of indefinite length. 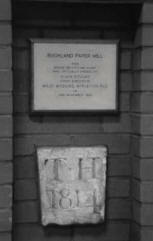 Mr William Phipps, who owned the mill at Crabble, installed one such papermaking machine in around 1807. According to Mr Radford Evans in his pamphlet ‘Recollections of River’ - this was the second machine to be erected in England; this proved to be incorrect, as six machines were operating in England by 1805. However, there is every reason to believe that the machine at Crabble was among the first few. In the 1817 ‘Guide to Dover’ it describes the Fourdrinier process and states "...at Crabble is an extensive paper mill, the property of Messrs William Phipps & Sons, in which is a very curious patent machine for making paper, which is capable of making a sheet of paper of any length whatever..."
Thomas Horne contemplated installing a patent machine at his Buckland Mill in 1822, a plan of the mill of that year shows the position it was to occupy. It is of interest to note that the mill was then a two storey building, brick to the first floor, wooden above, with a roof of tarred paper. The layout consisted of the beater room, work room over which was the drying lofts, the gelatine room, the counting house and, strangely, another room as large as the counting house called the wine cellar. There was also a vacant site marked for the erection of an open tank for boiling rags. The patent machine was eventually installed under the direction of Bryan Donkin - the first Fourdrinier machine at Buckland Mill. It is not known exactly when this took place, but it is believed to about 1830. William Weatherly occupied the mill from 1846 until his death in 1849. Charles Ashdown, assisted by his youngest son Henry became Buckland’s owner in 1849, and ran the mill until his retirement, unfortunately this was followed by Henry’s premature death in 1877. The eldest son, also named Charles, a banker in Dover, gave up his profession and went into partnership with Mr Henry Hobday, a practical papermaker. They bought the mill from Mr Ashdown senior and the firm became known as Ashdown and Hobday. 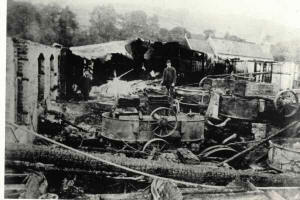 On 25th September 1887 the mill was totally destroyed by fire. Immediately afterwards the mill, including No.1 Papermachine was entirely rebuilt and remodelled which increased the output from 3 to 12 tons per week. The first spherical rotating rag boiler was installed at this time, the rags having previously been boiled in open tanks. On June 4 1999 Arjo Wiggins announced that due to over capacity in the group Buckland Mill was to close. 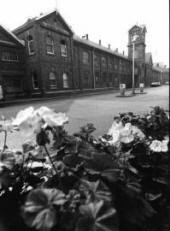 At the end of June 2000 Buckland Paper Mill closed, with production being transferred to other mills within the group. Employees were made redundant. And for the future..... See Buckland Mill Planning Brief by Dover District Council.